When you think of installing solar (PV) panels, most people think of the visual solar panels and don’t know that there are quite a few additional components that go into converting that solar power into power your toaster can use. In a nutshell, solar panels produce DC (direct current) electricity and our houses are wired for AC (alternating current) electricity. So, we need an inverter that will take that DC electricity and convert it to AC electricity so we may plug in our household appliances and use the power of the sun. 2. Provide enough technical detail for their dealer/distributor network so that their dealers and distributors understand the benefits of recommending or specing a Magnum Energy product in their installations. We created two diagrams, showing the basics of a solar system and how everything is interconnected. The diagrams gave a quick, visual way for the end user to see how a solar system would work in their home or business. We then provided a straightforward “info” page on each product, using straightforward explanations to show the benefits of each feature the products offered. Each “info” page included enough technical information so that a dealer/distributor could easily understand the “nuts-and-bolts” behind each product. The pages also included handy cross-reference lists detailing what accessories would work with each product (or, in the case of an accessories listing – what products the accessories would work with), helping to eliminate confusion when ordering. We also included a specification page for each product, giving quite a bit more detail for the more technically-minded. The final result was a catalog that was a useful document and reference for dealers and distributors and an effective marketing piece that the end user could peruse. Multiple versions. Updated approximately twice per year. 36 pages, plus cover. Printed in full color, 100# gloss cover, 100# gloss text. 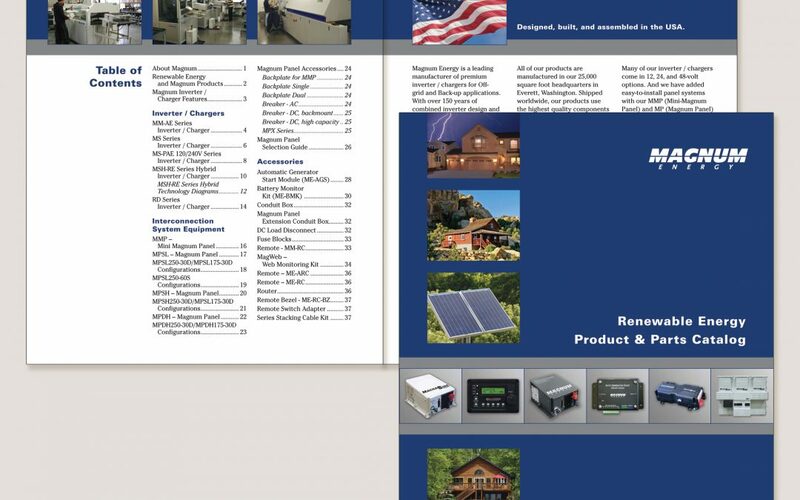 Download complete catalog from Magnum Energy.